The Boston Police Department announced via Twitter that three new suspects have been placed under arrest in the Boston Marathon bombing case. CBS News confirms the new break in the case. 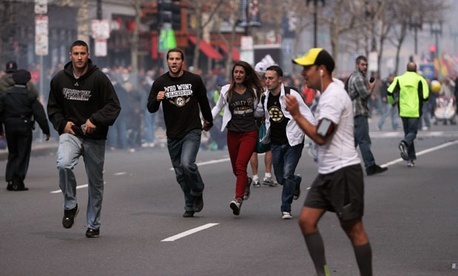 Jason Tuohey, an editor at the Boston Globe, reported that the three suspects are college students connected to Dzhokhar Tsarnaev through his school, UMass-Dartmouth, and CNN reports that they are in the custody of the FBI. CBS News also adds that the three suspects will be charged with crimes related to "harboring/aiding the bombing suspects after the fact." WCVB reports that they will appear in court Wednesday when the formal charges will be made public. NBC's Pete Williams reports that the three suspects were all roommates of Dzhokhar Tsarnaev, and may have removed items, possibly a backback, from their dorm on his behalf. (Over the weekend, police searched a Boston-area landfill in search of a missing laptop.) They were under surveillance by the FBI for several days, and any crimes that they may be charged with likely took place after the bombing, making them accessories after the fact. It appears there's no indication at this time that the suspects were aware of the bombing plot or helped in any way before it took place. Read more and check for updates on The Altantic Wire.